(Nanowerk News) Scientists at the National Institute of Standards and Technology (NIST) have developed the first “dimmer switch” for a superconducting circuit linking a quantum bit (qubit) and a quantum bus—promising technologies for storing and transporting information in future quantum computers. The NIST switch is a new type of control device that can “tune” interactions between these components and potentially could speed up the development of a practical quantum computer. Quantum computers, if they can be built, would use the curious rules of quantum mechanics to solve certain problems that are now intractable, such as breaking today’s most widely used data encryption codes, or running simulations of quantum systems that could unlock the secrets of high-temperature superconductors. Unlike many competing systems that store and transport information using the quantum properties of individual atoms, superconducting qubits use a “super flow” of oscillating electrical current to store information in the form of microwave energy. Superconducting quantum devices are fabricated like today’s silicon processor chips and may be easy to manufacture at the large scales needed for computation. 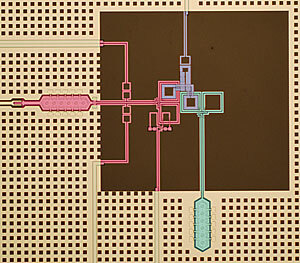 As described in a forthcoming paper in Physical Review Letters ("rf-SQUID-Mediated Coherent Tunable Coupling Between a Superconducting Phase Qubit and a Lumped Element Resonator"), the new NIST switch can reliably tune the interaction strength or rate between the two types of circuits—a qubit and a bus—from 100 megahertz to nearly zero. The advance could enable researchers to flexibly control the interactions between many circuit elements in an intricate network as would be needed in a quantum computer of a practical size. Other research groups have demonstrated switches for two or three superconducting qubits coupled together, but the NIST switch is the first to produce predictable quantum behavior over time with the controllable exchange of an individual microwave photon (particle of light) between a qubit and a resonant cavity. The resonant cavity serves as what engineers call a “bus”—a channel for moving information from one section of the computer to another. “We have three different elements all working together, coherently (in concert with each other) and without losing a lot of energy,” says the CU-Boulder graduate student Michael (Shane) Allman who performed the experiments with NIST physicist Ray Simmonds, the principal investigator. All three components (qubit, switch, and cavity) were made of aluminum in an overlapping pattern on a sapphire chip (see image). The switch is a radio-frequency SQUID (superconducting quantum interference device), a magnetic field sensor that acts like a tunable transformer. The circuit is created with a voltage pulse that places one unit of energy—a single microwave photon—in the qubit. By tuning a magnetic field applied to the SQUID, scientists can alter the coupling energy or transfer rate of the single photon between the qubit and cavity. The researchers watch this photon slosh back and forth at a rate they can now adjust with a knob.